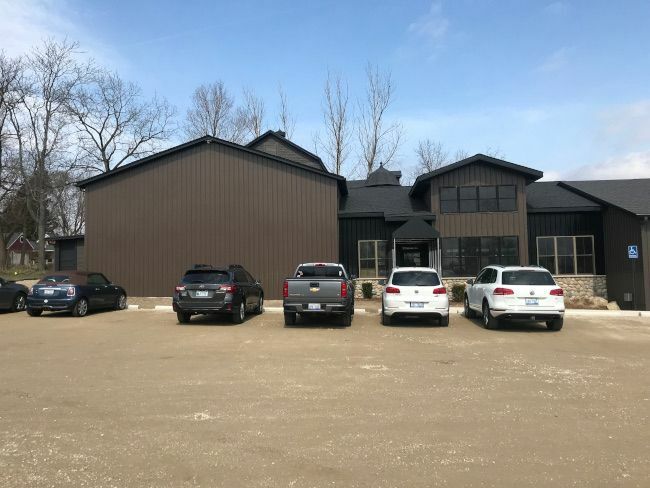 Have you ever been to The Critter Barn in Zeeland? I love that place. My kids love that place. It just stinks it’s so far away. 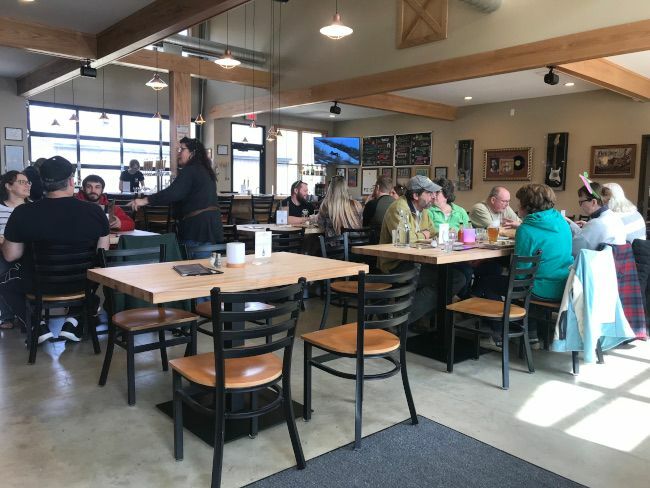 We usually spend an hour or so there then look for someplace to eat and something to do in the Holland area or Grand Rapids. We decided to take the drive to Zeeland last Saturday. It was supposed to be a nice day and we wanted to get the kids out of the house. As predicted, we spent a little over an hour petting and holding animals then the kids started losing interest. It was around 1:00 so past lunch time. 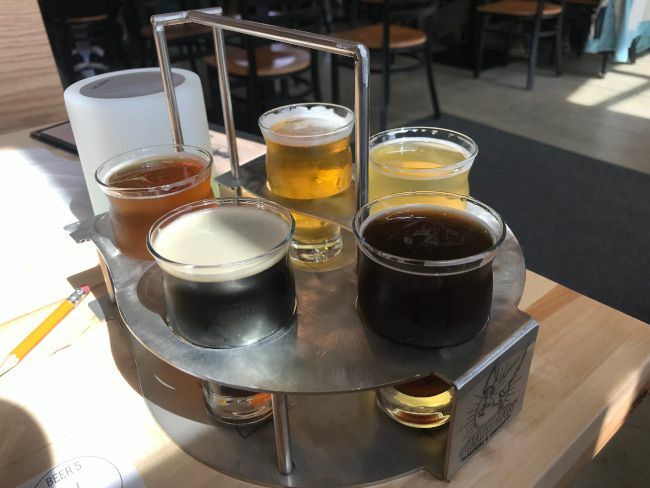 We made these plans with a brewery nearby in mind, so once we got back to the car, we headed towards Saugatuck. 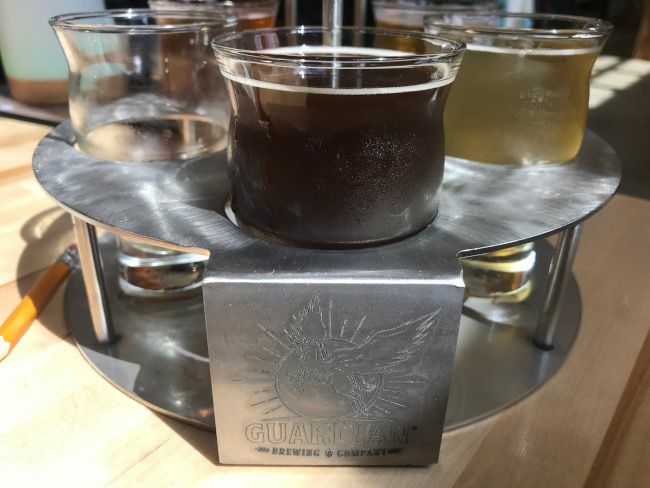 Guardian Brewing Company is actually just outside of Saugatuck on the corner of 63rd Street and Blue Star Highway north of town. The restaurant is in the old Red Barn Playhouse across the street from the Belvedere Inn which was built in the early 1900’s and has been a theater space in Saugatuck since the late 1940’s. 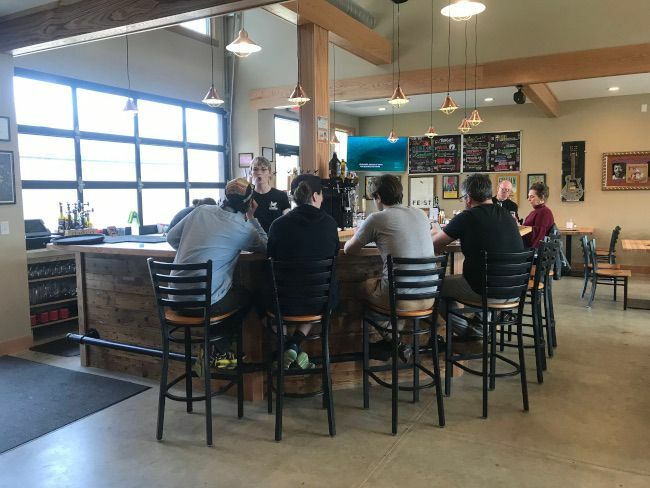 The building was purchased in 2017 to turn in to a brewery and opened in December of last year. By looking at the front of it, you wouldn’t have much idea that this used to be a red barn as it’s been covered with grey and brown siding. The restaurant space is in a lot of the old barn space. The space is wide open with concrete floors, light walls, wood and furniture, and large windows to let in a lot of natural light. You expect this place to look like an old barn but that’s not the case. It’s a much more of a modern, clean atmosphere. There’s a small bar near the back of the space surrounding their large number of taps. The bar was pretty full when we stopped in with what looked like a bunch of regulars. The bartender was kind of moderating a conversation between everyone as she was filling glasses. We took a booth right inside the door because we didn’t know how the kids were going to act and we didn’t want to bother people. A waitress saw us come in and brought over some food menus and explained the light system. 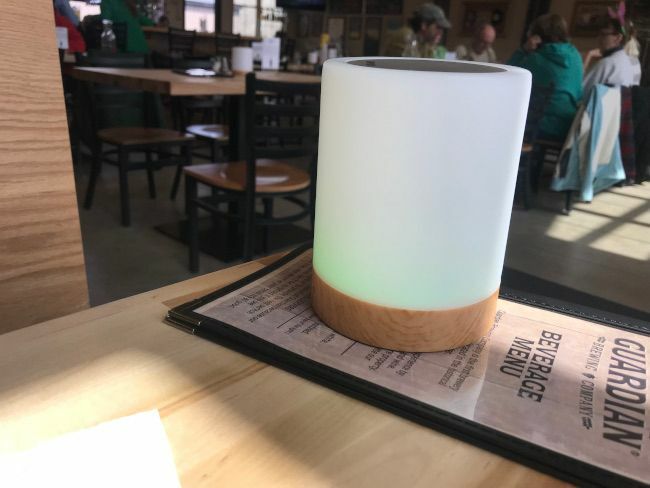 There are little lights on each table and the wait staff won’t bother you unless you switch the light to red to get their attention. We didn’t realize it until the end of the meal but there’s a large board game area near the bathrooms. The kids were…..alright,….but they could have been better. 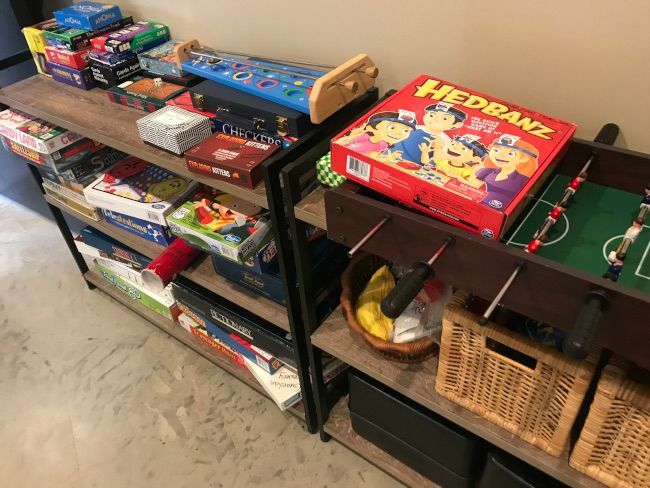 Had we noticed the board games before the “go pee before we get back in the car” trip to the bathroom we would have grabbed a couple to entertain them. We started with drinks. We got Fanta’s for the kids while I did a flight. They have a pretty large beer list and I wanted to try as much as I could. The waitress handed me a slip to fill out which I did pretty quickly. When she came back with J and the kids’ drinks, I was ready to go. For such a young brewery, they had quite a few variants of their beers. I started with a Rum Mountain Howler. This is a milk stout aged in Jamaican Rum barrels. It’s a variant on their Mountain Howler which is a stout brewed with lactose added. The rum flavor was there but in the background to these sweet stout. 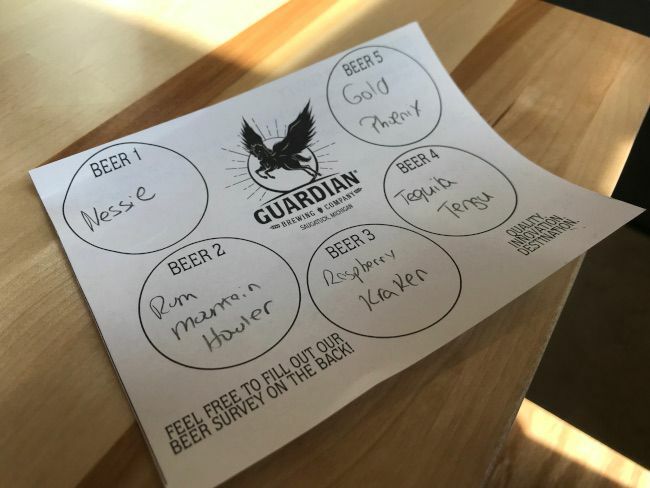 The second beer I picked was Raspberry Kracken Hunter. This is another stout and another variant. Kracken Hunter is the base beer for this and a raspberry puree is added to it. This one may have been my least favorite of the flight. Too much sweet with stouts don’t always work for me. I went for another barrel aged beer with Tequila Tengu Wit. 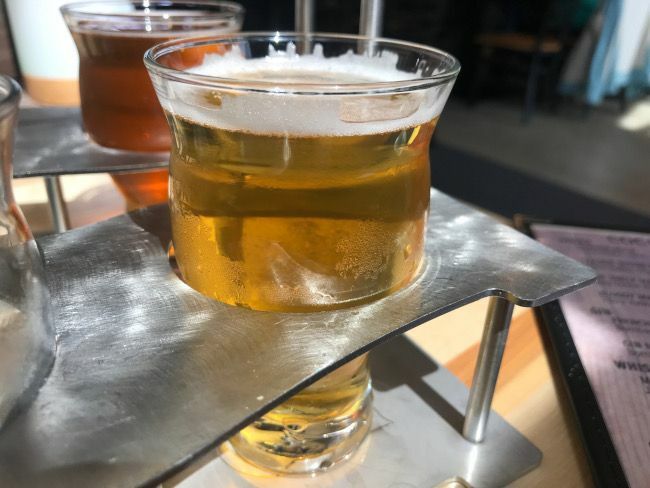 The Tengu Wit ….which is a witbier…is aged in Reposado Tequila barrels. Beer four I got in to something more familiar to me. I picked the Gold Phoenix IPA to start winding down this flight. 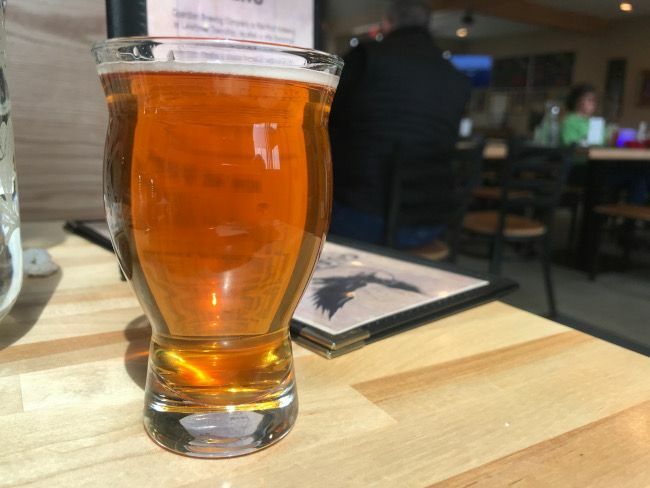 Gold Phoenix is their sippable IPA coming in with just 5.1% abv. The flight ended the wa yit alway does for me…with a DIPA. Guardians entry into this category is Nessie. Dry hopped with mosaic hops and juniper berries, this one was a great end to the five beer flight. 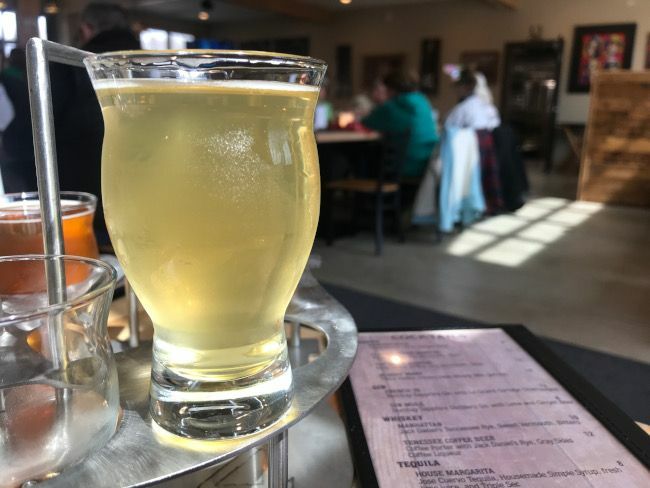 Guardian doesn’t do their own ciders but they have a couple from Tandem Ciders in Suttons Bay. J picked the Smackintosh which is a super sweet cider made with Macintosh apples. We started our meal with Queso and Chips. 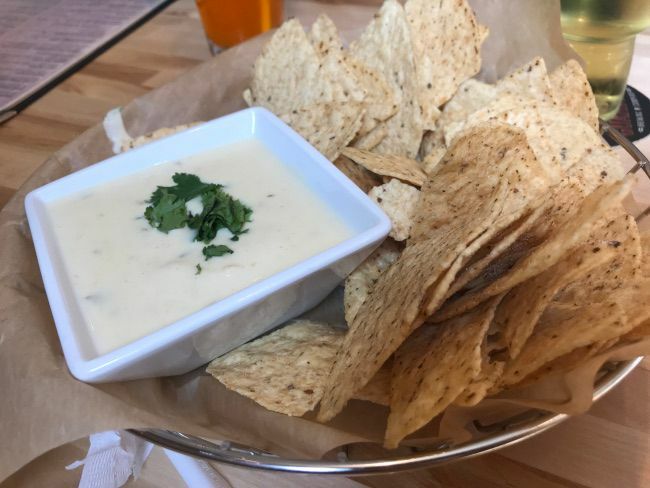 This is a house made cheese sauce and tortilla chips. The kids went right for the chips when the server set it down. We warned them the cheese might be spicy but they didn’t care. It had a little bit of a spice to it but not something that’s overwhelming for a young tounge. The basket of chips didn’t last long on our table. All four of us were pretty hungry. The food menu has a decent variety of hot sandwiches, hot dogs, soups, and salads. I picked the Cuban bypassing the “Chicagy Style Italian Beef.” I just can’t do beef sandwiches outside of Chicago…they’re never right. I have no idea if this one is or not but it’s a chance I stopped taking a long time ago. 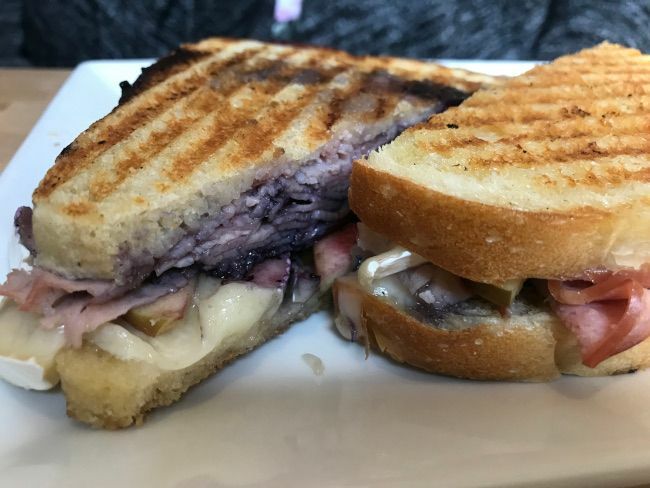 The Cuban is pulled pork, ham, gruyere, pickles, pickled onion, and mustard on Dutch Crunch bread. The sandwich is fantastic. 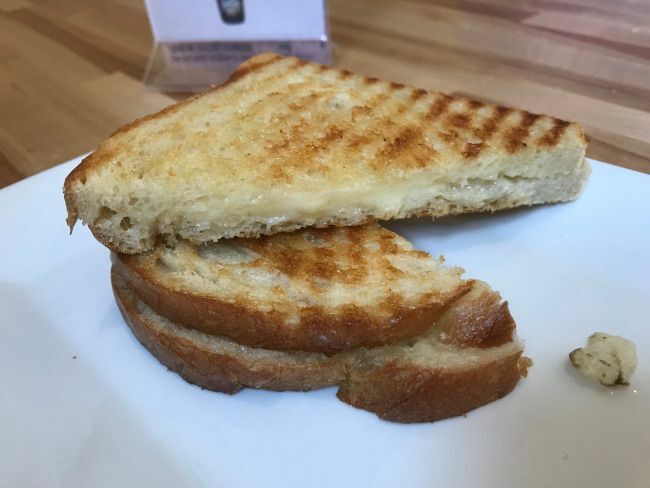 The meat was overflowing from the bread but it was held back by the melty, gooey cheese. 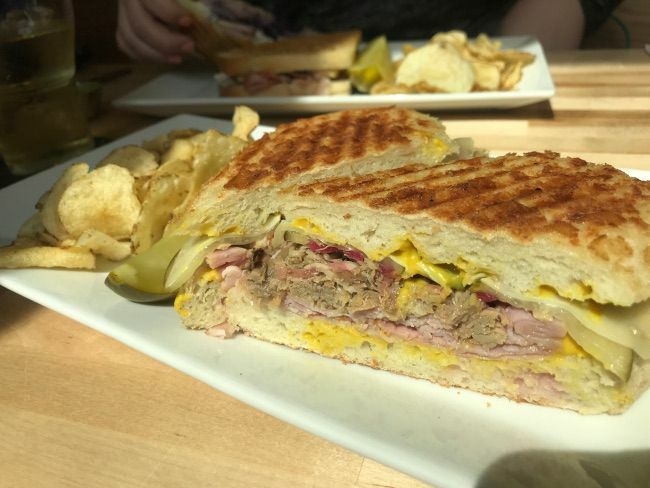 The pickles and mustard can do so much to either hurt or help a Cuban and this sandwich falls in to the latter. It had just a light spread of a spicy mustard and just a couple super vinegary pickles but they added so much flavor to the pork. The sandwich came with kettle chips and a pickle spear. J did the Ham and Cheese sandwich and I kind of had to do a double take when I first saw this. The sandwich is ham and brie on Country French bread but it also includes apples, pickled onions, and a house made blueberry tarragon jam. The sandwich was purple. She said it was delicious. She loved the sweetness from the blueberry and the crunchy from the apple. I wouldn’t have expected the jam to dye the entire sandwich blue but that’s what blueberries do. 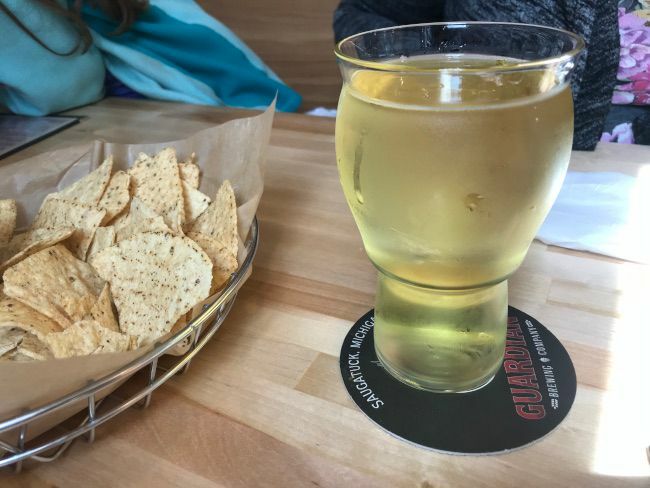 There is no kids menu at Guardian Brewing so we had to find something the kids would eat off a regular menu. L took us both by surprise and said she wanted tacos. We told her these were not Taco Bell tacos and she was fine saying she had eaten soft shell tacos at a friends house. 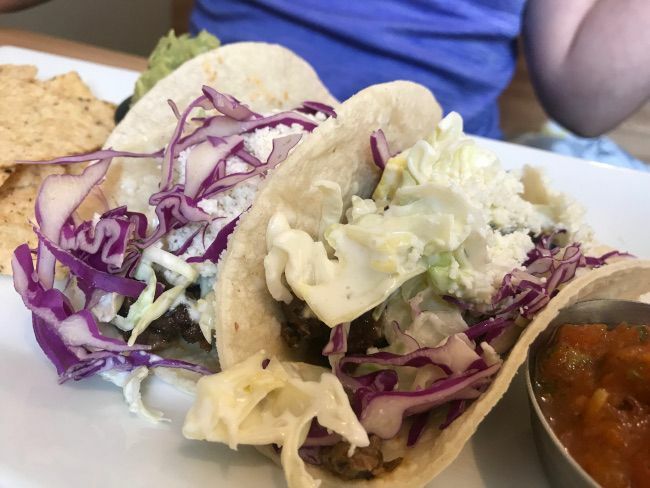 We got her the Vegan Beyond Beef Tacos because she likes beef tacos and has no idea what “vegan” or “Beyond Beef” really is. The tacos are served choice of tortilla (she chose corn) with green cabbage slaw and queso fresco with chips, quac, and salsa on the side. To my surprise, she ate all of the beef and filling from one of the two tacos. She said they were good but she didn’t want to eat the second (not unusual for her). She also munched on a few of the chips but we had already eaten quite a few chips with the appetizer. For B we found a Grilled Cheese. Fortunately, this is similar with white cheddar sandwiched between two slices of Country French bread. B was being B and ate about half of a half then just played with the other half to the point I didn’t want to eat it or bring home. We should have paid a little more attention to what he was doing. The first thing he grabbed off his plate though was the pickle spear. He takes after his Papa in loving pickles. 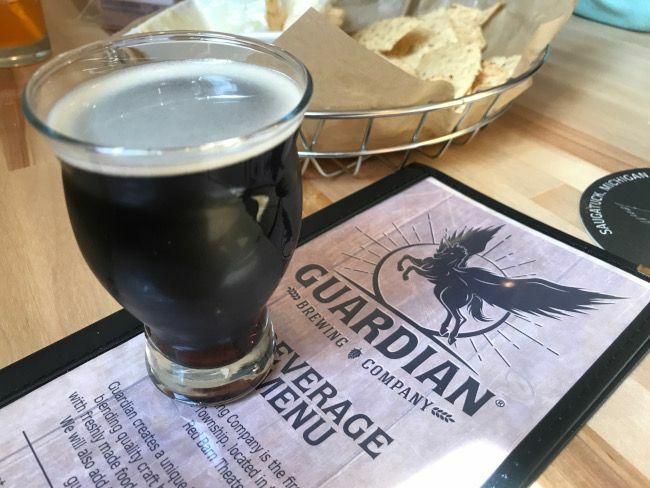 Our bill for lunch at Guardian Brewing Company was a little over $60 before tip. 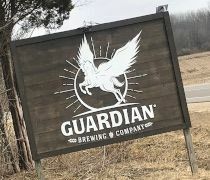 Guardian Brewing Company is a great brewery with big plans on this plot of land just north of the busy tourist community of Saugatuck. The only downside for us was the lack of a kids menu but we did were able to find something both of our kids like. I’ve said it before on posts about other breweries, they don’t have to cater to families. Alcohol is an adult thing and that’s totally fine. We still really enjoyed the meal and really enjoyed the drinks. I can’t wait to see what else they have in store for this historic structure.